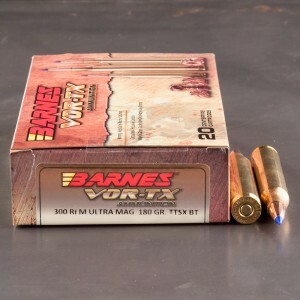 300 Ultra Mag ammo, also known as 300 Rem Mag or 300 Remington Ultra Magnum, is a 30 caliber round loaded in a 72mm shell. The cartridge was introduced in 1999 as an answer to cartridges like the 300 Win Mag and 300 H&H magnum. 300 Ultra Mag is capable of taking all game across the North American continent and is know to be a solid killer at long range. 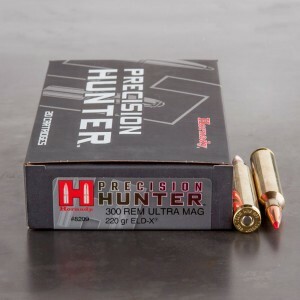 300 Remington Ultra Magnum ammunition is one of the most powerful 30 caliber cartridges that mainstream manufacturers are currently producing. The 72mm case is very long and can be loaded to be incredibly hot loads, and is second to only one proprietary Weatherby cartridge. While the round packs hefty recoil those who can withstand that punch are rewarded with powerful ballistics. 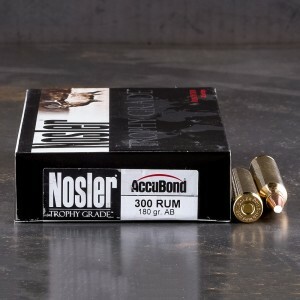 These rifle rounds have proven to have superior performance to the powerful .308, 30-06 and even the 300 Winchester Magnum. The cartridge is capable of pushing a 200-grain bullet at a little over 3,000 feet per second. The bullet does drop significantly at longer ranges, and takes an experienced shooter to effectively use the round at long range. Even at long ranges the round is still capable of transferring high levels of energy and penetrates very deeply into a target. #1 Ammo For Me Thank-You V.M. Lloyd said: "Great ammo and great service from ammo to go." Doug said: "Speedy delivery from ammo to go. Pleasant people to talk to."